Need more information about booking Home 7295354 ? A selection of 3 beautiful self-catering holiday cottages located at Upcott Squire Farm nestled in the beautiful North Devon countryside near Exmoor national park. Upcott Squire House and Holiday Cottages are set in 24 acres of lawns, farmlands, woods and wildlife ponds, where guests are free to roam at will. Upcott Squire Farm is situated just outside the charming rural village of Nomansland, famous for the good food served at The Mount Pleasant Pub. Within two miles are the traditional countryside villages of Rackenford and Witheridge. This is an ideal base for exploring all the local tourist attractions including Exmoor, Dartmoor, the quaint villages and vibrant market towns and of course the beautiful North Devon beaches. Cherry Blossom Cottage is a beautiful cottage barn conversion. 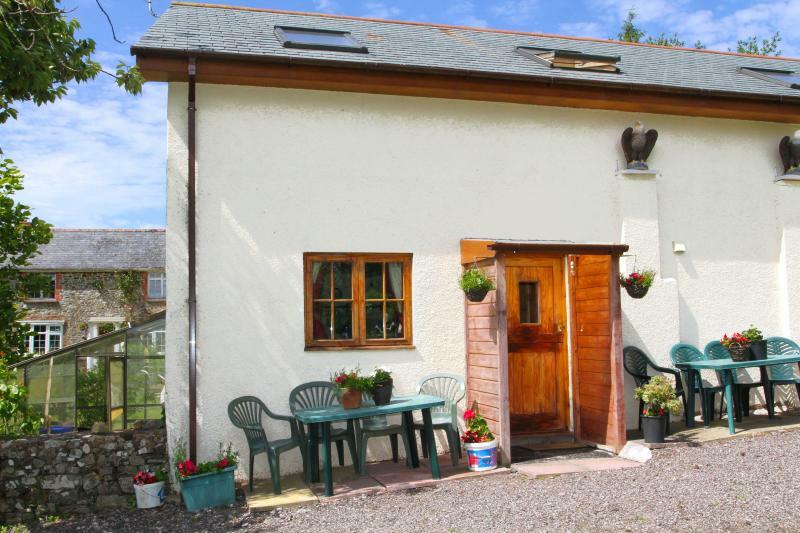 It is a self-catering cottage for up to 6 people offering spectacular rural views. Cherry Blossom Cottage has 3 bedrooms and 2 bathrooms. It has been decorated in a traditional old Devonian farmhouse style and has great views of the surrounding fields. It has full electric heating for all year round comfort. This is a dog free cottage. The living area is an open plan design (20 feet x 20 feet) with authentic pine faced beams. This cottage has beautiful countryside view doors open onto a private garden offering beautiful views of the surrounding countryside.s of Upcott Squire gardens, grounds, farmlands and woodlands. It is a good size, light, comfortable and is fully double glazed. There is a tidy, well kept open plan fully fitted kitchen/ diner with an electric cooker, microwave, dishwasher, automatic washing machine etc. The dining area has an extending pine table with 4 matching chairs. The Master Bedroom is a charming double bedroom with a wardrobe, dressing table and double bed. The Second Bedroom (11 feet x 9 feet) is furnished in a traditional farmhouse style. This bedroom consists of a single bed with a pull-out bed underneath. The upstairs bathroom consists of a power shower over the bath, a basin, toilet, heated towel rail and an airing/ storage cupboard with an electric heater. There are train and bus services available in the nearby town of Tiverton. A car/taxi is needed to travel from Tiverton to Rackenford. The property owner, Mr Peter Blight lives on site in Upcott Squire House and is available when needed by his guests.